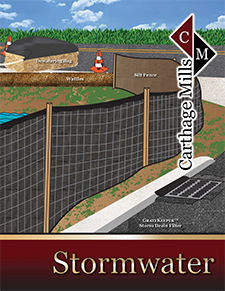 Carthage Mills' FBX™ Filter Bags are designed to trap silt, sand and other sediment fines from construction sites before they can do damage to the environment; and to assist the contractor with an economical means of avoiding the costly cleanup of storm water systems. Typical applications include the dewatering of construction and excavation sites, as well as dewatering lakes and ponds. FBX-80 is Carthage Mills' standard Filter Bag, and is manufactured with FX-80HS, a sturdy 8 oz/yd2 nonwoven geotextile. FBX Filter Bags can also be made using a wide variety of geotextiles depending on overall size requirements, the type of sediment being pumped, and other site-specific or Engineering specification needs. All FBX™ Filter Bags are constructed using a double-needle J-seam, and incorporate a fabric flange large enough to accommodate up to a 6" discharge hose using the attached heavy-duty straps. As water is pumped through the bag, it captures most of the sediment resulting in the discharge of clear to near-clear water. When full, the FBX Filter Bags can be disposed of as a solid waste; cut open and mixed with the on-site soil and seeded; or otherwise directed by the site engineer. Carthage Mills' FBX Filter Bags are a cost-effective means to help protect the environment and meet storm water regulations. For maximum flow and filtration, FBX™ Filter Bags should be placed on a level bed of aggregate or hay bales. Insert the discharge hose and secure it tightly using the attached straps. Discharge Rate: FBX Filter Bags can typically accommodate flow rates up to 1,000 gal/min when empty. This decreases as the bag collects sediment and should be monitored to avoid rupture of the bag or excessive leakage around the discharge hose. FBX™ Filter Bags and the trapped sediment should be disposed of as directed by the site engineer or local regulations. FBX Filter Bags are stocked in a variety of sizes from 5' x 5' up to 15' x 30'; call for pricing and availability.